USB Security for your files and folders. Password protect your USB drives. USB Secure works with all portable data storage devices such as thumb drives, memory sticks and external hard-drives. Data protection is PC independent and does not require installation and any administrator rights at the other end. Your data is protected with multiple layers of fortification ensuring maximum security of your password-protected data on any portable medium. USB Secure is fast, reliable, and PC independent, making it the most flexible and robust portable drive protection software in the market. Accessing your protected data on a portable drive is convenient, you can choose to open the actual file or view them as read only. 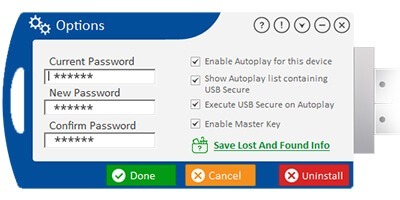 USB Secure is PC independent and does not require installation on the other end, making it truly independent software. USB Secure requires no lengthy installation procedures, ensuring that you’re able to protect your private files with minimal effort. 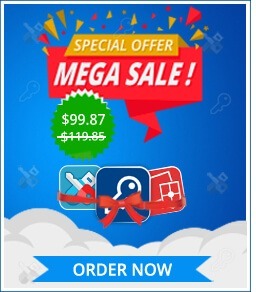 With a single click, your files are protected using the latest in data security technology, offering quick data protection. With its simple interface and user-friendly design, USB Secure can be utilized by the average user. 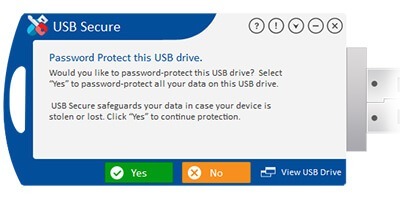 USB Secure protects your personal information from identity thieves with its multiple security features. Data protected by USB Secure on lost or misplaced portable drives is impossible to hack, ensuring your piece of mind. Portability and small size make external drives vulnerable to theft or loss, thus increasing the odds that lead to ID fraud. 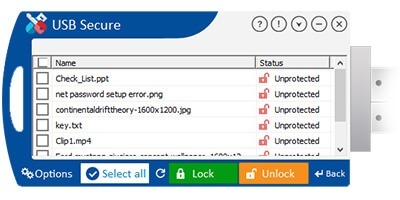 View or modify your protected files securely using virtual drive, it eliminates risks associated with unlocking data protection. 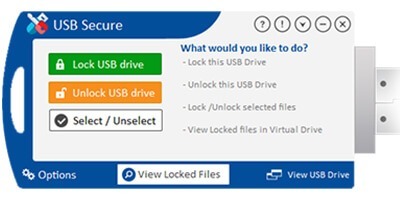 Quickly lets you add files to be protected through a virtual drive, eliminating the need for complete data unlocking. Save time and effort with virtual drive, it enables you to have access to your files in less time than it takes to completely unlock protection. Fast & Easy to Use! 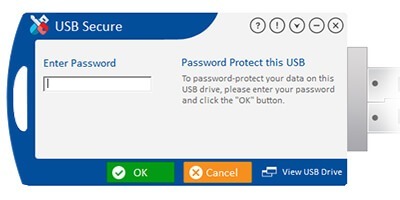 USB Secure is fast and password-protects your USB and other flash drives with a single-click operation. You’ll never again have to worry about lost or stolen USB drives if you have protected it with USB Secure. The amount of data you can protect is only limited to the storage capacity of your portable drives.